About 3x life size. An instructive model dissectible into 5 parts to clearly show the complicated structure of the bones and the nasal cavity covered by mucous membrane. Individual cartilage and bone are colored. On base. Size, 38 x 72 x 8 cm. About 3x life size. An instructive model dissectible into 5 parts to clearly show the complicated structure of the bones and the nasal cavity covered by mucous membrane. Individual cartilage and bone are colored. The nasal concha can be removed (entry to the ethmoidal labyrinth is visible). The right side shows the nasal septum (removable) and the mucous membrane of the nasal cavity with the 3 nasal passages and nasal conchae. The middle concha can be removed to view the olfactory nerve and olfactory lobe. On base. Size, 38 x 72 x 8 cm. 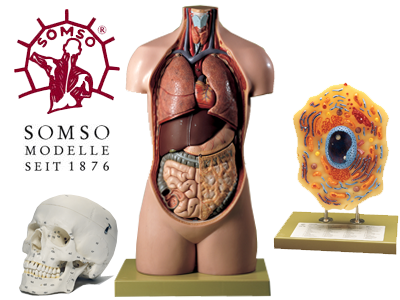 Superior craftsmanship combined with the guidance of world-renowned anatomists has rendered Somso the world's finest model-maker for over 130 years. This family-owned company has upheld its philosophy of "nature is our model" and designed each human, animal, and plant model with the utmost attention to scale, form and presentation of anatomical features. Upon order, skilled artisans hand-assemble and hand-paint each model at one of two German-based workshops. All models must meet Somso's extremely high quality standards for scientific accuracy, fine artistry, function, and durability before being shipped to customers. This ensures that every customer receives not only a museum-quality teaching aid but also a unique work of art. True to the adage "you get what you pay for," when you invest in a Somso model, you pay for excellence.